I have always loved designing nurseries that work for families. In our old house, our nursery was a teeny tiny room that could hardly hold a full bed and a nightstand before kids. So when it came time to plan our nursery for our first son, simple functional furniture was the key. Everything we put in the room had a purpose and a small footprint. 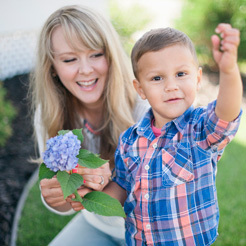 With our second child, although his nursery was nearly double the size of the nursery at our old house, I still put some of the small nursery lessons I learned into play. But for some of us, nurseries are corners of a room, or even closets that have been transformed for a baby’s space. These spaces can be totally functional, but you have to take care to make sure that every item in the space serves a really good purpose, and employ some key design tips to make sure that the space doesn’t look overwhelmed by clutter. 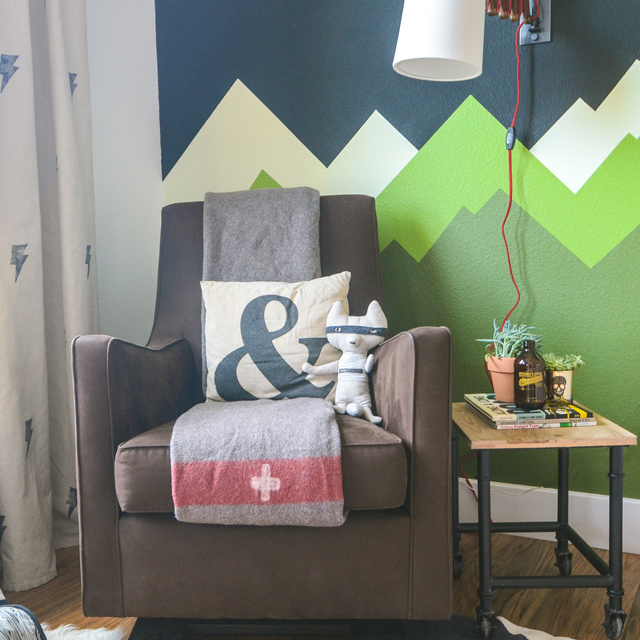 I tapped my favorite design bloggers and moms for their best small nursery hacks and tips. What I learned was invaluable and left me with two nurseries that were smart and tidy, and rarely ever cluttered (it sounds impossible but it totally worked!). Read on for my favorite tips that they shared with me. Amber Wills, the brilliant creative behind Wills Casa (their nursery was featured in the most recent Young House Love book) suggests we rethink the ‘must have items’ typically found in a nursery. She suggests to “maybe skip a foot stool and use a pouf or pillow.” I love that a pouf could be used for years to come, long after the glider or rocker is out of the room, and it could add fun color. Plus, poufs and pillows could easily be pushed aside or moved to a closet when needed. 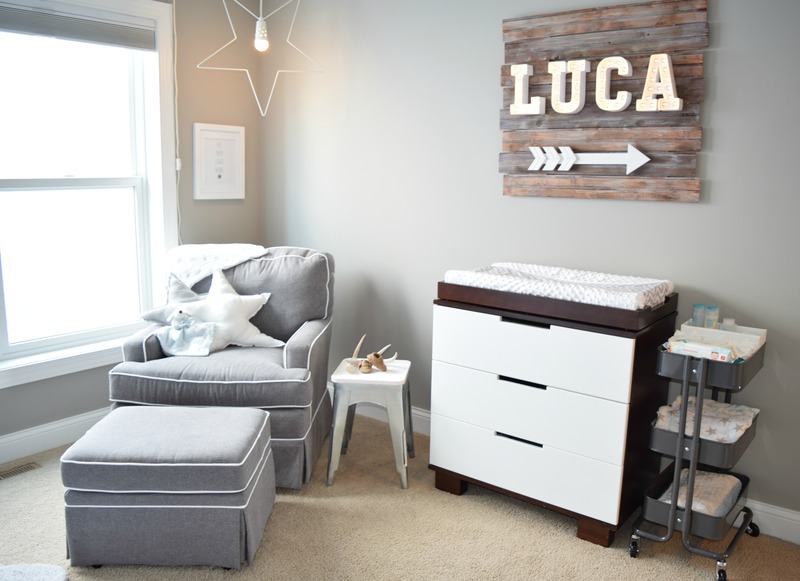 For money and space saving, Melissa Chambers from Melissa Creates suggests “using decor items from the shower in the nursery.” She says, “Cluttering the walls with too many signs and photos can make the room feel even smaller. The small Lincoln banner on the wall behind his crib was from my shower.” By keeping walls bare, the space looks larger than it really is. 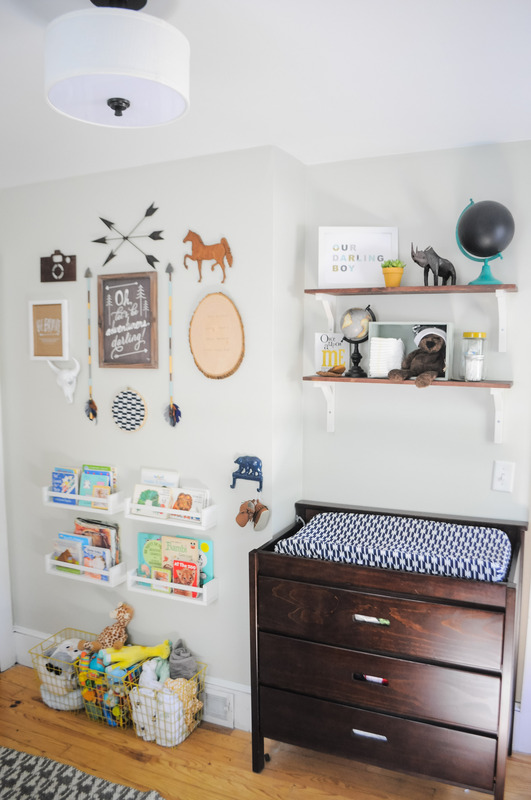 “I love the IKEA spice rack hack we did in our son’s nursery instead of a bookshelf,” says Tiffany Delangie of Pretty Real blog. The price and size are perfect for a small nursery. “I also love using vertical storage and under bed storage to maximize space,” Tiffany adds. Look for storage solutions that keep a slim profile. Think storing vertically instead of horizontally. 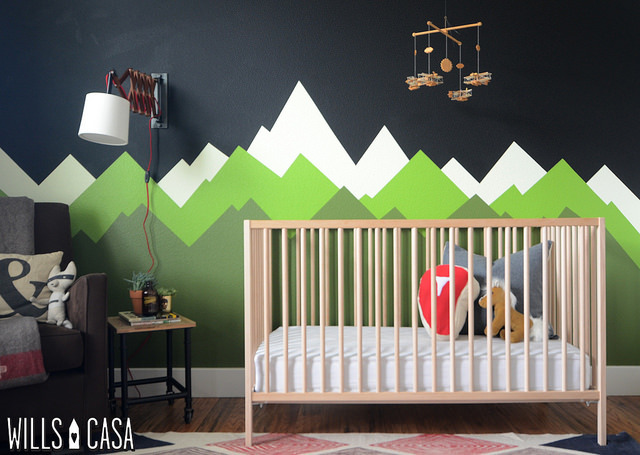 I had a vision for each of my boys’ nurseries before they were born, but as they got older, they had their own tastes and things they wanted to see in their rooms. By sticking to neutrals for the big-ticket items, we were able to swap out decor items easily without having to reinvent the wheel when it came to furniture. 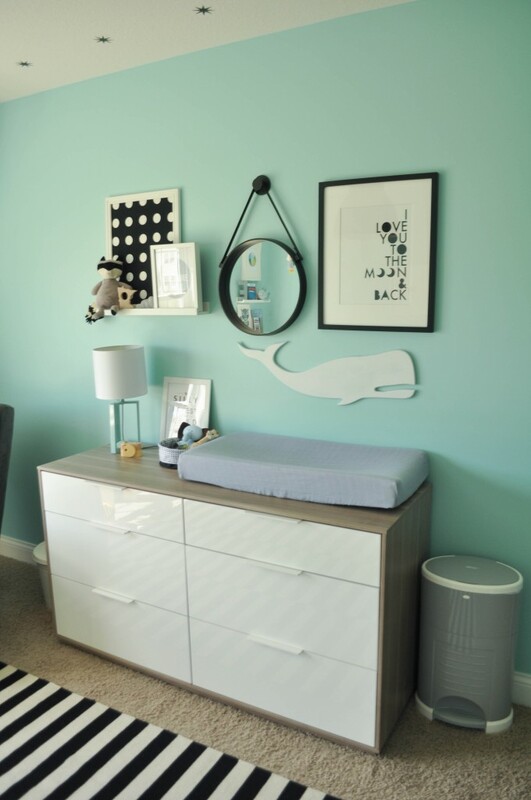 Mama blogger Ashley from Mama Brooks blog pulls her room together with simple neutrals and fun objects. “Add bright and simple details to your small space by incorporating white ceramic accents like these animal figurines from Hobby Lobby. 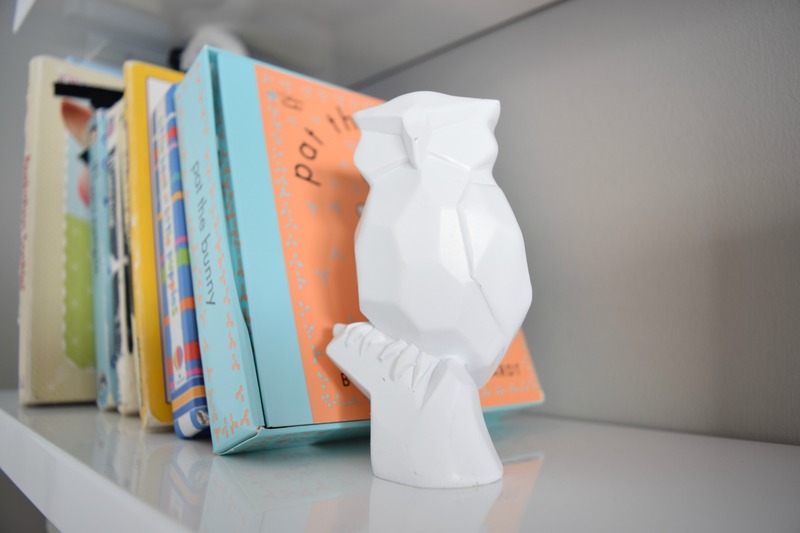 You can coordinate them with your specific theme and place them on bookshelves or find ones that hang on walls,” she says. These add so much character while not taking up much space or overwhelming the space by making it busy. There’s no need for a dedicated piece of furniture here, especially when space is tight. Instead, put a changing pad on the dresser or simply use the floor. A crib like the Babyletto Modo or even mini cribs will do the trick. With no curves or frills, it’s easy to tuck int a space, even if it’s as small as a closet. 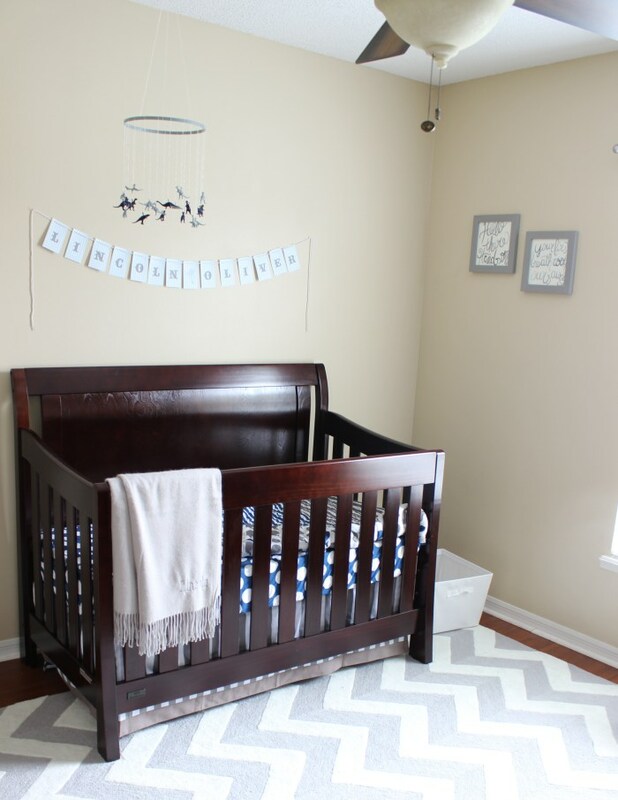 This minimizes the space the crib takes up both on the floor and on the wall. In a small space, I prefer to use only a few colors. One pop of color with neutrals works best. 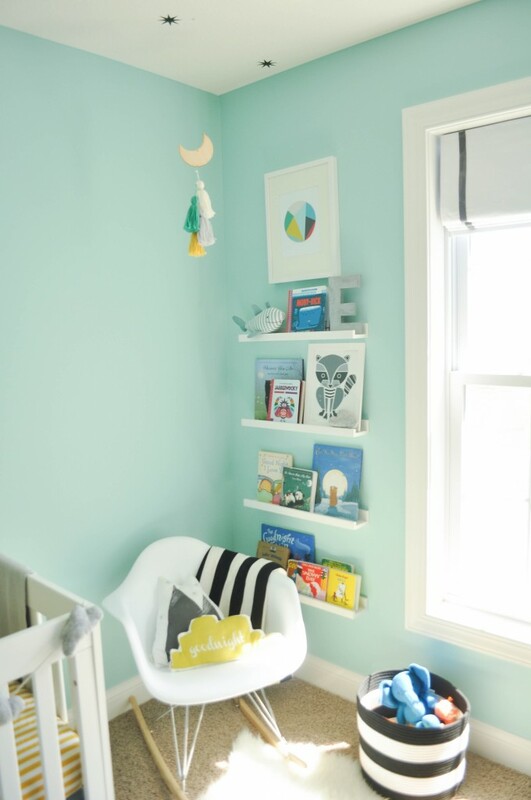 Busy decor and too many colors can overwhelm a small nursery. We chose to paint the walls a pretty bright color and accent with neutrals and just a small touch of yellow. Rather than include bulky bookshelves or floating shelves, we added IKEA’s Ribba picture ledges to my sons’ nurseries to store key books. We consciously kept the collection to only his faves, and rather than accumulating books over the years, we regularly donated books they grew out of in favor of only keeping around the titles they wanted to read weekly. This one’s easier said than done, especially as my kids got older and birthday and Christmas presents that they loved began to overwhelm their spaces. We decided to include only one small basket for toys in their bedrooms, and especially in their nurseries. It guaranteed less time for cleaning up and kept their rooms much less cluttered. We employed the “one in, one out” rule—so every time they got a new toy they loved, we decided together which old toy they wanted to give away, donate, or if it was too raggedy for either of those options, to throw away.